Kings XI Punjab made lives difficult for themselves as they fell to yet another narrow defeat, this time at the hands of Mumbai Indians at the iconic Wankhede Stadium in Mumbai. Here's how all the players performed in the match. 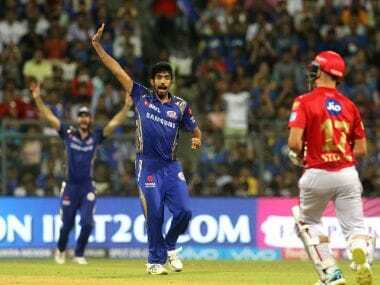 Kings XI Punjab made lives difficult for themselves as they fell to yet another narrow defeat, this time at the hands of Mumbai Indians at the iconic Wankhede Stadium in Mumbai. 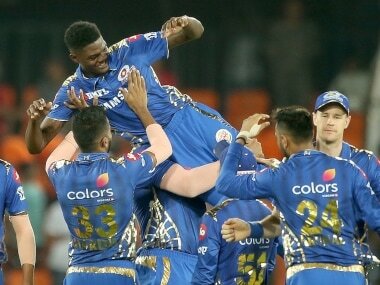 Batting first, Mumbai Indians rode on Kieron Pollard’s fifty, Krunal Pandya’s 32 and little cameos at the end from Mitchell McClenaghan and Mayank Markande to post a challenging total of 186/8 on a good batting track. Andrew Tye was the pick of the Punjab bowlers who disrupted the momentum at the start and middle overs with his spell of 4/16 in four overs. 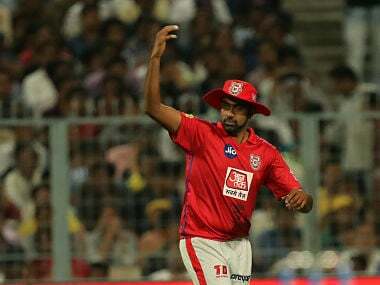 The skipper Ravichandran Ashwin also supported him well with his spell of 2/18. However, expensive bowling from other bowlers let the hosts get away. Punjab, on the other hand, looked to be in control of the chase till the 16th over with the scoreboard reading 145/1 and KL Rahul and Aaron Finch still there at the crease. However, the 17th over from Jasprit Bumrah changed everything as he rocked Punjab with two quick wickets of Finch and Marcus Stoinis. He came back in the 19th over to claim Rahul’s wicket as well and hence sealed victory for Mumbai with that wicket. The last over was finished off nicely by McClenaghan who registered bowling figures of 2/37 alongside Bumrah’s 3/15 as Mumbai won by a narrow margin of three runs. Here's how all the players performed in the match. Rahul turned out to be the lone fighter for Punjab once again in this match. However, he was unable to get his team over the line as a result of some fabulous piece of bowling from Bumrah. Rahul smashed 94 runs in 60 deliveries and dominated the Mumbai bowlers for the major part of the innings until he was outfoxed by Bumrah in the 19th over with Punjab still requiring 20 runs to win off nine deliveries. Tye produced his third four-wicket haul of the tournament as he put on a scintillating spell of slower deliveries on show. He registered bowling figures of 4/16 in his four overs and batsmen struggled to score runs against him throughout his spell. His victims included Suryakumar Yadav, Evin Lewis, Ishan Kishan and Hardik Pandya. 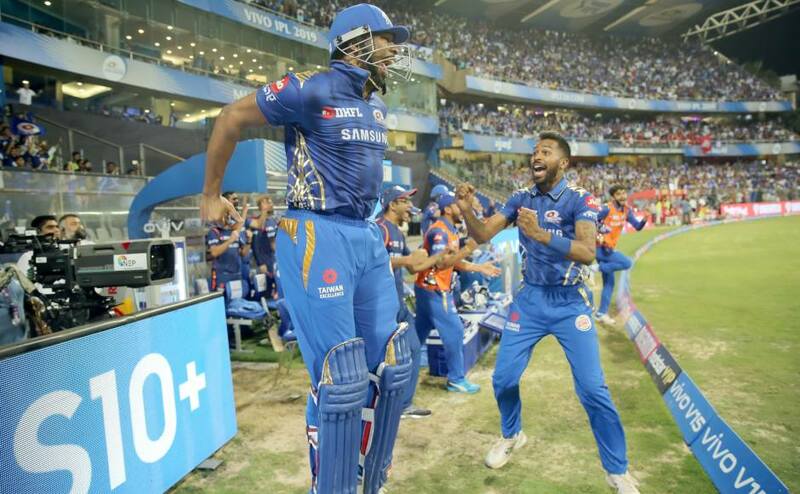 He was the one who set Mumbai completely on the back foot by claiming the first three wickets in quick succession. Mumbai wouldn’t have won this match without Bumrah’s scintillating spell of 3/15 in his four overs. All three of his wickets came in the death overs as he outfoxed the batsmen with his variations and slower deliveries. First, he picked up the wickets of Aaron Finch and Marcus Stoinis in the 17th over of the innings. Then he came back in the 19th over to deal Punjab with the most lethal blow having dismissed Rahul with Punjab still requiring 20 runs to win. Thus he sealed the victory with these three wickets in his final two overs. Pollard was once again given an opportunity by including him in the playing XI of this match at the expense of JP Duminy. And he proved that he is still one of the most dangerous batsmen going around as he completely changed the momentum of the game with his big hitting. He walked out to bat at No 5 and smashed fifty runs off just 22 deliveries after Punjab had set them on the back foot by claiming the wickets of Suryakumar, Lewis and Kishan in quick-succession. However, he was dismissed in the very next delivery trying to heave Ashwin over the long off boundary. McClenagahan played a significant role both with bat and ball in Mumbai’s victory on Wednesday. First he contributed 11 crucial runs off just seven deliveries towards the end of Mumbai’s innings and then came back with his bowling later in the match to register figures of 2/37 in his four overs. His victims included the likes of Chris Gayle and Yuvraj Singh, whom he dismissed at two crucial stages of the match. Finch was promoted up the order at No 3 in this match and he did justice to his position stitching together a 111 run stand along with Rahul for the third wicket. He played the second fiddle in the partnership scoring 46 runs off 35 deliveries. However, his promising knock was brought to an end by some brilliant piece of bowling by Bumrah in the 17th over of the innings. Ashwin bowled a brilliant spell of three overs in which he conceded just 18 runs and took two wickets. His first victim was Pollard who tried to continue on his rampage and only ended up handing an easy catch straight to the hands of the fielder at long off. And the second victim was Ben Cutting who dragged a carom ball bowled wide of off stump only to hit it straight to the man stationed at deep mid-wicket. Both of his wickets came in the death overs but still were not enough to be a decisive factor for their victory. The elder Pandya brother walked out to bat when Mumbai had lost three wickets in quick succession. He watched his skipper getting dismissed as he stood as the other end as well. However, he combined with Pollard stitching together a 65-run stand for the sixth wicket and thus led Mumbai’s fight back. He contributed 32 runs off just 23 deliveries before he was dismissed Stoinis in the 15th over of the innings. Suryakumar started in his usual stylish way playing elegant shots in the gaps and using his timing to perfection to utilize the powerplay overs. He had raced away to 27 off just 14 deliveries and looked promising for more. However, his innings was cut short by some brilliant piece of bowling from Tye in the sixth over of the innings. Kishan started off in a fiery manner as he showed some aggression smashing the bowlers to the boundary. He hit two sixes and one four in his 12-ball knock of 20 runs before his innings was cut short by Tye in the very next delivery to the one in which he dismissed Suryakumar. Mumbai were thus reduced to 59/3 in no time and looked to be in deep trouble. Axar Patel tried his best with his all-round abilities in this match. He bowled three overs for just 24 runs at an economy rate of 8.00 that too when the Mumbai Indians scored at an overall run-rate of 9.30. Then he walked out to bat towards the end and tried to score the remaining runs as he remained unbeaten on 10 runs off just 8 deliveries. Gayle showed quite some intent early on in his innings as he smashed 2 fours and one six to race away to 18 runs off just 10 deliveries. However, McClenaghan got the better off him with a bouncer in the 4th over of the innings as he miscued a pull and ended up ballooning it up in the air. The catch was finally taken by Cutting at mid-wicket to bring an end to Gayle’s cameo. Rohit Sharma’s poor form with the bat in this tournament continued as he struggled for 10 deliveries for just 6 runs before he got dismissed. Ankit Rajpoot was the one who claimed his wicket. However, Rohit marshaled his troops very well in order to squeeze out a thrilling victory by just 3 runs. Markande conceded 34 runs in his three overs and couldn’t offer Mumbai the effectiveness with spin they needed. However, he added some much needed runs — 7 runs off five deliveries — towards the end that turned out to be a deciding factor in the match later as Mumbai won by just 3 runs. The Australian all-rounder proved to be pretty expensive with the ball and also got dismissed pretty cheaply in this match. He conceded 43 runs in the three overs he bowled, Krunal’s wicket being his only consolation. And then he was dismissed for just a solitary run by Bumrah at a crucial stage of the innings. Rajpoot did well to claim the wicket of Mumbai skipper Rohit. However, he was taken to the cleaners afterwards by both Krunal and Pollard as he leaked a total of 46 runs in his four overs. His expensive bowling didn’t help Punjab at all in restricting Mumbai to a low total. Lewis couldn’t make the most of his opportunity today as he got dismissed for just 9 runs. He started off with a massive six off Mohit Sharma’s bowling over long off. However, he failed to deal with Tye who dismissed him in the very first delivery he bowled. The younger Pandya brother didn’t have the best days on the field in this match. First, he contributed just 9 runs in 12 deliveries with the bat and then conceded 42 runs off 4 overs to increase Mumbai’s woes further. He looked totally out of sorts both with bat and ball. Cutting proved to be totally ineffective both with the bat and and ball. First he took 7 deliveries to score 4 runs and then conceded 15 runs off the only over he bowled. Thus he neither delivered with his big hitting prowess that he is known for nor could he produce anything effective with his bowling. Yuvraj walked out to bat at No.6 with 20 runs to score off 9 deliveries. However, he could score just a solitary run and wasted three deliveries for that at the fag end of the innings when Punjab needed only boundaries. Mohit could do nothing to help Punjab curb Mumbai’s run-scoring. He even went for runs to tail-enders like Markande and McClenaghan. He conceded 34 runs in his three overs and thus helped Mumbai gain the advantage in the match. Tiwary just faced one delivery and smashed a boundary in that and thus remained unbeaten on 4 runs. It would be unfair to rate him on the basis of this little performance.